Posted in News on August 6, 2018 by Emily Summars. The Meteorological Phenomena Identification Near the Ground – or mPING – team was awarded the Larry R. Johnson Special Award for significantly contributing to operational meteorology. NWA will present the award during its annual meeting in late August. Individuals or groups must be nominated for the Larry R. Johnson Special Award. 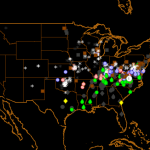 MPING is a project by NOAA’s National Severe Storms Laboratory and the University of Oklahoma Cooperative Institute for Mesoscale Meteorological Studies. The free application was listed in Scientific American’s list of 8 Apps That Turn Citizens into Scientists. 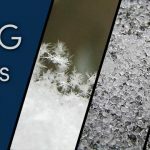 View live reports and help NSSL and OU CIMMS researchers improve understanding of how different types of precipitation can be identified by radar. 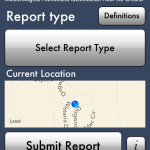 mPING reports submitted by users.